Your swimwear may be sorted, but what will take you from lounging on the beach to cocktails in the beach bar? 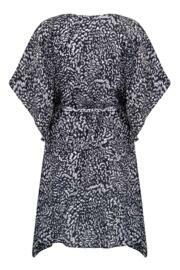 A luxurious, lightweight kaftan, that’s what, and our Mixology version is one of the best. 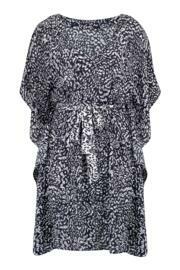 This on-trend animal print kaftan will make you look chic in an instant, while the tie in the middle is great for showing off your waist. Lightweight and luxurious, it’s gorgeously soft to the touch and won’t crease, even if you’ve used your beachwear as your sunbathing pillow. With batwings that are floaty enough to keep you feeling cool, the side-seams mean you won’t be totally exposed should things get a bit breezy. In fact, you may not want to go back to the hotel to dress for dinner!